Uru-what? Everyone keeps asking us why we are going to Uruguay. And all that we can say is why not? I was fascinated by Uruguay. It is so rarely mentioned as a country, but with a little research I found out that it is considered one of the most stable, advanced countries in South America. On top of that they were also the first country to provide laptop computers to every grade-school student. It sounded like more than just a satellite of Buenos Aires, but a modern city. And I was tired of tripping on the many holes found throughout BsAs sidewalks. 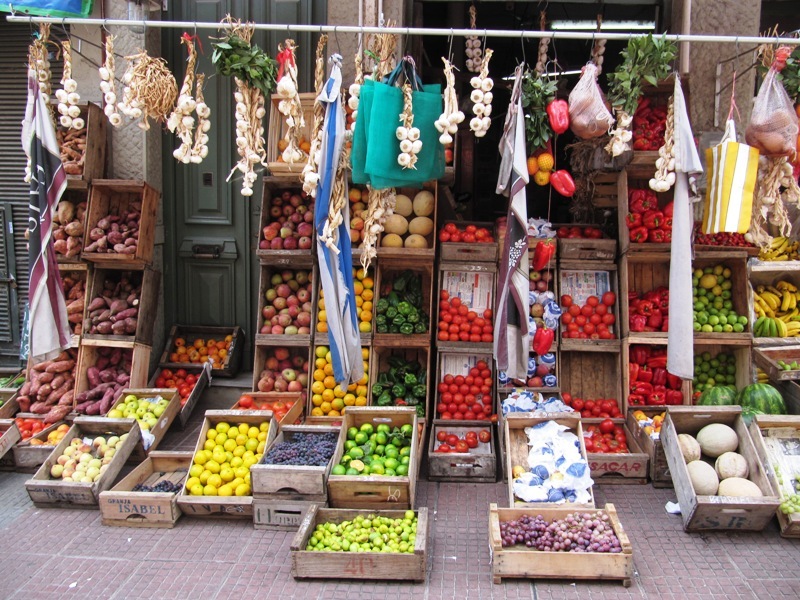 Uruguay is a ferry ride away from Buenos Aires and turned out to be an amazing experience. 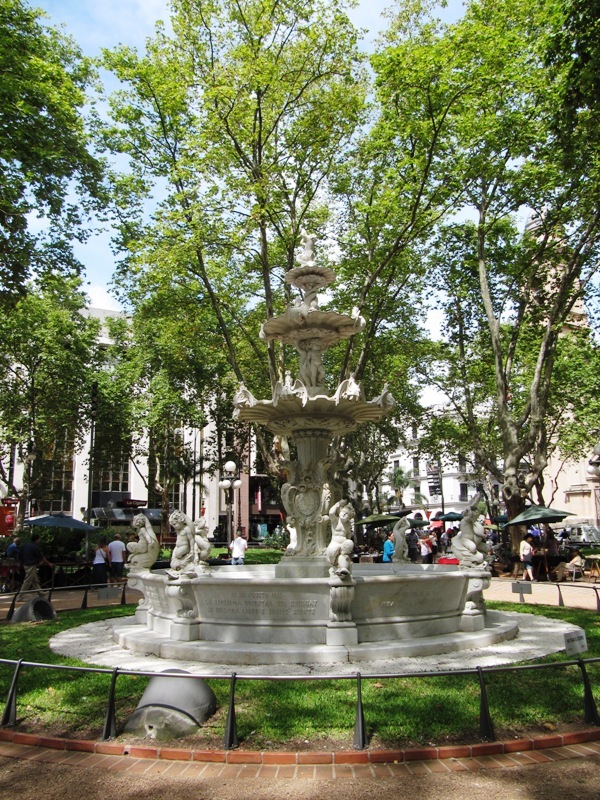 Many people seek the historic town of Colonia, but we decided to go directly to the capital city of Montevideo. What we found was some of the best barbeque, beautiful beaches and a clean progressive city vibrant with life. The city is filled with picturesque nooks and crannies. Peeking around a corner and we were often surprised to find beautiful colonial buildings, fountains and of course markets selling deliciously plump produce. One great benefit of having friends and family join you on a trip is that the cultural experience of a city seems to increase exponentially. Interpreting the culture, tasting the food and seeing the sights is a group activity shared with laughs and conversation. Carmen’s parents joined us for two weeks, making us 8 feet 4 mouths to explore and eat our way through more parts of South America. 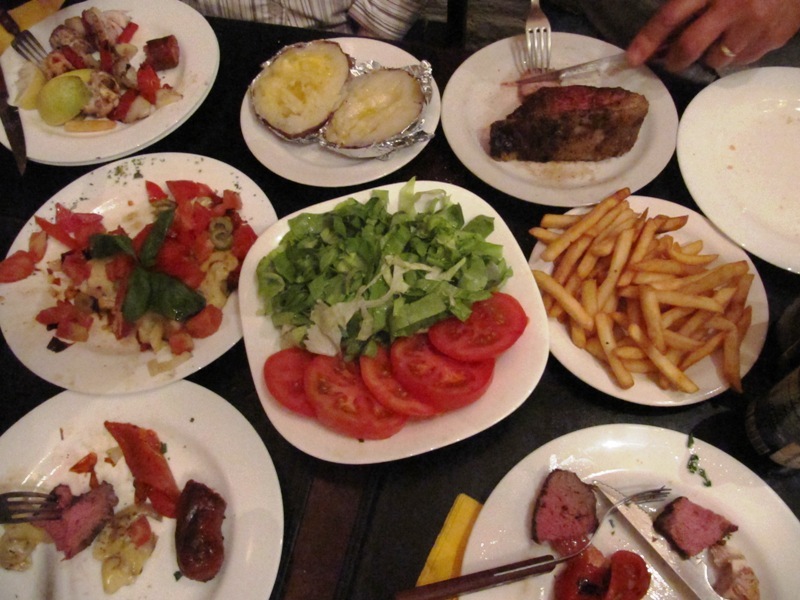 Our first meal in Montevideo immediately put all the parilla barbeque places in Buenos Aires to shame. We went to La Otra, it was a sleek dimly lit restaurant with a woodsy theme. I felt right at home as they decorated all their wall using a wallpaper of stacked and chopped wood. Although I did not miss those hours of my childhood chopping and stacking wood. The food included an array of excellently grilled meats and vegetables. 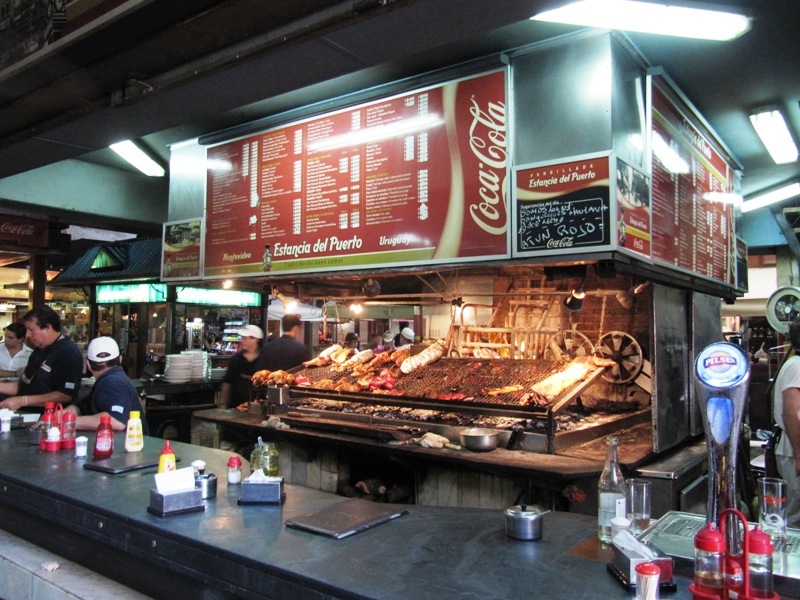 One of the main differences between Argentinian and Uruguayan barbeques is the use of a slanted grill. A simple advancement, but the Uruguayans have worked out a better way to not overcook their meat. There is this amazing market (Mercado del Puerto) with twenty or so barbeue restaurants all grilling theit best meat and seafood. They also have their own variations of grilled concoctions. 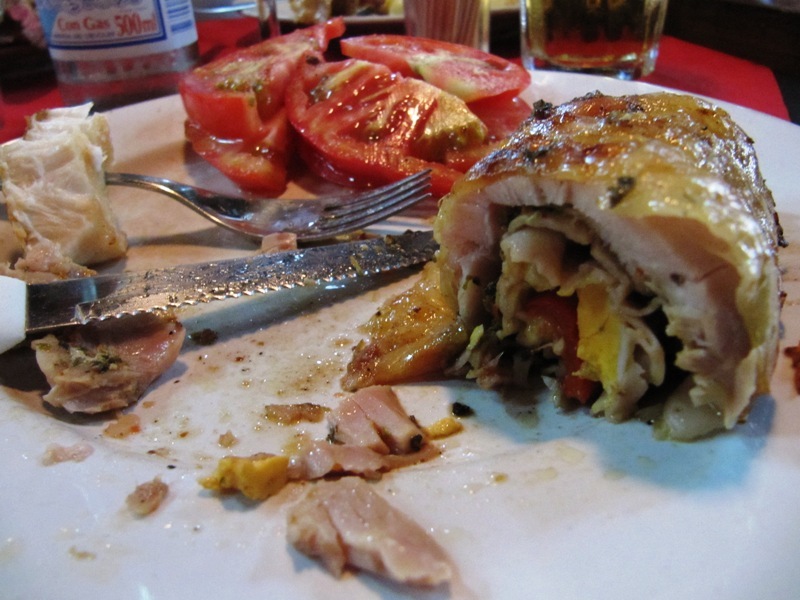 I ordered a pomplona de pollo which was a piece of chicken that had been flattened and rolled with ham, bacon, cheese and grilled vegetables, then grilled over an open fire. Mmmm. By this time in our trip we had been wanting water. The heat in Buenos Aires was sometimes stifling. 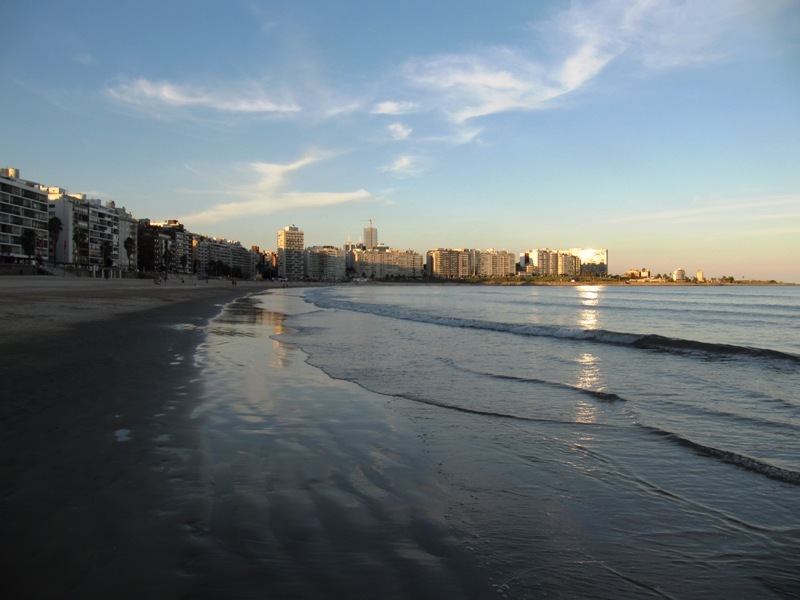 To our great relief, Uruguay had an amazingly beautiful beach and a rambla (coastal sidewalk) that stetched for miles. Why not more time in Uruguay?